Welcome to the System Administrator Forum! Get hands on help on making the most with your experience and connect with a global community of Blackboard users like you. Go ahead and introduce yourself in this thread! And be sure to update your profile to include areas of expertise to make it easier to find help from your peers. If you are new to our Community, check out Community Help to review documentation on how things work over here. We will continue to build out this space! Share The specified item was not found. and submit feedback to our Product Managers Everyone is a teacher and a learner here. Looking for official product Help documentation? Please visit our Help site. I'm Matt Deeprose. I've been system admin for out Blackboard service since July 2000 at University of Southampton in the UK. I do the GUI based admin, some linux based scripting mainly around customising our data integration feeds, and I work with a dedicated linux system admin and an Oracle DBA who are in dedicated system's teams. The team I work in manages almost all the elearning services we have at Southampton. 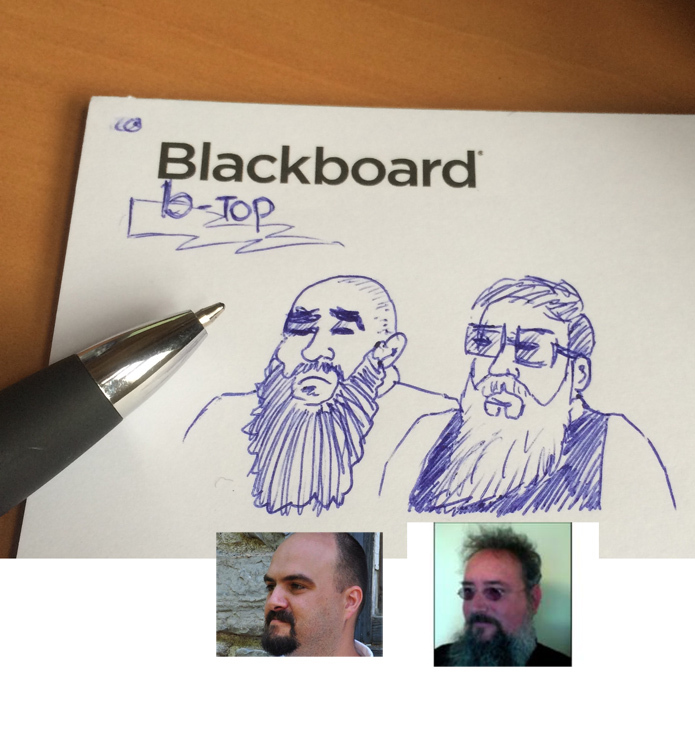 We have been from Blackboard 5.0 to 9.1 2015 Q4. We've also gone from Solaris to Linux to Linux VM, from Oracle to Oracle RAC, and then back to Oracle again, and various data storage methods. I recommend that any system admins who are not already on the ASU Blackboard mailing lists BLKBRD-L and BB-ADMIN-L to join those as one can learn a lot from the postings there. I also recommend subscribing to receive notifications of known issues etc from the support.blackboard.com site (Home > Manage Article Subscriptions), since in my experience the sooner you know about a problem the better. My name is Miroslav Lulic and I am a Blackboard admin at California State University Chico. I have been in this position since 2008 and over that time we have migrated from Webct Vista to Blackboard Learn. We are self-hosted and manage a large number of integrations with BB Learn. We also get support from a linux OS team and Oracle database team on campus. We are currently on 9.1 October 2014 CU3 version with plans to install CU4 this summer. Beyond that we use google analytics and also have a process to gather analytics directly from Blackboard Database to use for reporting on usage and traffic. We use red hat 6 and oracle database and flash netapp for content. App nodes are VMs and databases will be as well by end of summer. I'm Alex Parker and am one of our Blackboard Administrators at Liverpool John Moores University in the UK. Have worked on Blackboard since our first implementation in the version 5 days! How things have moved on! We're self hosted, currently on October 2014 release, no plans to upgrade this summer. Windows environment, clustered SQL DB, 5 web/app servers. I would say my experience is in the server side of the application, high availability solutions, upgrades, bug resolution etc. Looking forward to exchanging ideas, solutions, frustrations etc with everyone! I am Patty DiGiacobbe. I am one of two Blackboard Administrators at Eastern Gateway Community College in Eastern Ohio. I have been working with Blackboard since November of 2013. I consider myself a newbie to Blackboard and still have so much to learn. We are managed hosted on October 2014 release and plan to upgrade to 2015 Q4 in August. I work in the Technology Services department, so my job encompasses most of the technology used by the college. In Blackboard, I work with the Building Blocks, upgrades, student and faculty assistance, outside vendors (Pearson, Cengage, Testout) and user accounts. I look forward to learning more and more about Blackboard. I am Rick Dijs, Bb-administrator (Since june 2006) @ Avans University of Applied Sciences in the Netherlands. We're self-hosted and at this moment in the process of a clean install to the oct 15 rel. Looking forward to exchange knwowledge and share ideas. I'm Suzanne Hess and one of the Blackboard Admin and User Consultant with California State University East Bay. I have been here for almost a year and before this, 4 years at Drake University as the Blackboard admin (LMS Technology Specialist). Both university's migrated from Self Hosted to Managed Hosted last year. Currently, we are testing/planning on moving to SaaS in Fall 2016 from Managed Hosted 9.1 Q4 2015 CU1. We have several different software programs integrated into Blackboard, such as Zoom, VoiceThread, Respondus LDB, Panopto, iClicker, SmartSparrow, Piazza, Soft Chalk, Turnitin, etc. We started setting up hierarchy as well and very interested in the discussion around this. Looking forward to exchanging information! I am Diane Hart Deci, Blackboard GUI Admin for Edgewood College (a small Dominican College in Madison WI) for the last 7 years. My role is to lead the Blackboard Team through thick and thin. In addition to having my GUI Admin Certificate, I also am a Blackboard Certified Trainer. Currently we are running Q4 2015 but will be moving to Q2 2016 at the end of July. I am excited to be a part of this community. I am Jeannine Isom. I am the Blackboard system admin for the State of NM Human Services Department. I am also the instructional designer for all of our web based classes. I was a Blackboard node admin for 2 years and just recently completed the online certification training for Blackboard Course Delivery GUI Admin. Looking forward to being part of the community. I’m a Learning Technologist from the UK (Lancashire – Edge Hill University). Been doing this for nearly 10 years with Blackboard. Previously used Moodle to teach in school. I also teach (using Bb of course!) - so my experience covers both technical & practical aspects of Bb. I usually manage to cycle to work and swim every day. PS - Can someone please tell me how to get those links opening in a new window (sorry to be dim - I've tried adding target="_blank" to the a tag!? I am relatively new to the position - just over a year. I have been teaching within blackboard for almost 4 years and prior to that I was a student that utilized Blackboard in many of my courses. I am looking forward to learning from all of your expertise. Hi all, I am an adjunct professor in SE KY. I teach an online medical terminal class at a Technical/Community College. For those of you who are unfamiliar with SE KY, we are a very impoverished area, and this area is literally a job desert! So getting our kids and older adults (re)educated is of utmost importance. That's why the Technical/Community College System is so important. I began working with Bb in '14, when I was literally thrown into the class with two weeks notice! Praise the good Lord, my brother helped me that whole semester, or my goose would have been cooked! LOL The only experience I had prior to that was to listen to my college student children gripe about it! I have seen a lot of things, while I've been trying to find my way around, that I want to learn. All y'all throw around all these big words and acronyms that I could have learned once upon a time, but will probably never learn now. I'm just a WYSIWYG kind of person. I have already learned a lot from Gail, Matthew, and, Rick, I think. Thanks, y'all. Looking forward to learning more! I'm Farah, Blackboard admin for INTI College Malaysia. This is the first time involving in Education industry. Previously I was IT Support for Dell and T-System. I'm looking forward to learn something new in Blackboard. I am the System Admin for William and Mary in Williamsburg, Va. I am new to the college but have been a System Admin for Blackboard for over 15 years and used to work for the Virginia Community College System. I have been through several version and updates with Blackboard over the years. We just recently migrated to Blackboard SAAS Managed Hosted. It was not an easy process but things are moving along. I am excited to join the community and learn more about Blackboard and helping faculty and students use this system. I have also taken courses as a student and helped teach courses as a faculty member, so I understand both aspects of how Blackboard functions work. I am also certified in using Blackboard Collaborate and like to know more about Ultra. I look forward to connecting with others and learning more! Hi Manpreet-This listserv is not run by Blackboard, but I believe you email that address and request access. ASU gets back to you pretty quickly, I hope this helps! I'm TJ Lawhon. I've been at Marshall University as AN LMS Administrator for 9 years as of this past March 3. Now I am THE LMS Administrator here at Marshall and I'm hoping to use this community as a tool to become more successful in my job here. We are lagging behind on updates. We're still on 9.1 Q4 2014 and it has been stable for pretty much two years. That said, I know that we will have to move eventually so I'm here hopefully to gauge the stability of some of the newer versions. Side note, if anybody knows of any Blackboard jobs near the beach, give me a call. If you find one with sunny, 85 degree weather year round, let me know . Hello, I'm Roy Schalk. I've been at Central Michigan University for about 15 years. Our team has recently taken over the organizations Blackboard Transact support after the previous admins left. I've been in the system for about 4 months. We are currently running 3.13.3.0 and have been working on rolling out EMV pinpads. Hey, Roy! Welcome to the System Administrator Forum. I just started to investigate Blackboard Transact for my institution (Our Lady of the Lake University in San Antonio), so I will be eager to hear about your experiences and progress. I'm a GUI Bb Learn admin at Western Kentucky University in Bowling Green, KY. We've been using Blackboard since 1998 when it was CourseInfo 3, and I've been involved with the system the whole time. I've been full-time at WKU since 2000, but worked as a student and as temporary staff prior to that. I also have primary responsibility for Blackboard training on our campus, and I coordinate IT training across the entire Information Technology Division. After years of submitting proposals, I finally got to present at BbWorld 2017. Thanks to everyone who attended the session and help make it a success! Congratulations, Shawn for being selected to present at Bb World! And thanks for introducing yourself here. I look forward to hearing more from you in the days to come.